Happy Memorial Day, and hurray to the start of summer! The cool and cloudy weather in SF this weekend definitely marked the start of June Gloom, and to tell the truth, I just love it! After a busy week and a pre-dawn alarm on Friday morning, I was so glad to have the weekend in sight. We ordered our customary Indian feast and giggled over I Don't Know How She Does It before falling fast asleep. After both waking up early on Saturday morning, we spent some time catching up with family–John shared a Mediterranean brunch with his cousin while I gabbed on the phone with my Mama and my dear friend Marge. After all that girl talk, it was time to tackle my closet–I can't get anything done when it's a wreck! Then I settled in with my laptop and the summer issue of Martha Stewart Weddings (I'm not the only one who reads it twice in one sitting, am I?) to soak up all the loveliness on offer this past week. John and I enjoyed a trip to our happy place, the gorgeous grocery store down the street, to pick up fresh fish and plenty of avocado for tacos–the perfect summer food, even if you find yourself eating them in a sweater! We curled up in bed to warm up with our favorite new reads, The Rules of Civility by Amor Towles and The Rest is Noise: Listening to the Twentieth Century by Alex Roth, respectively. It was another early night, which meant John was up with the birds on Sunday–and working on such a wonderful surprise! We're planning to spend the day at the California Academy of Sciences, enjoying empanadas at Nopalito and practicing a little yoga–what are you doing this Memorial Day? What a charmed life you lead, my dear! your happy place sounds truly very happy indeed!!! :D have a great week! I hope you're having just as wonderful of a day today as you did over the actual weekend! I spent most of the weekend at the pool, enjoying delicious Tex Mex with my sisters, and pouring over the new issue of Occasions Magazine that I contributed to! once again your weekend activities far surpass mine. I have got to get Kevin on board with this whole cooking breakfast wonderfulness. Lena, I love reading about your weekends. You and John are like the cutest couple ever. That recipe your mom sent sounds delicious. I hope you have a great week. Sounds like a really amazing weekend Lena! All of it sounds absolutely lovely, glad to hear you had such a marvellous holiday weekend! What a glorious weekend!!!! Happy Memorial Day!! What a fabulous long weekend! I don't think I've ever had bougatsa - it sounds delicious! 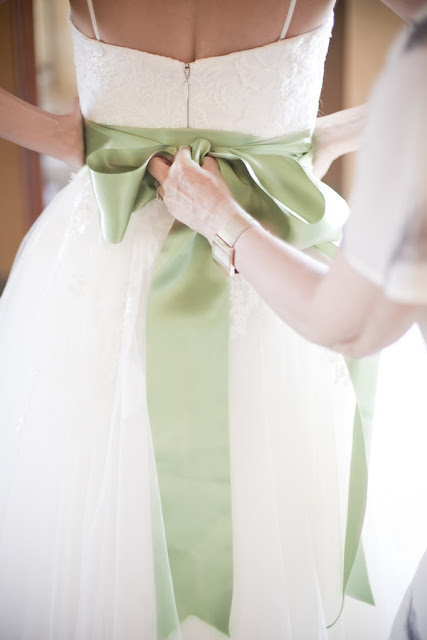 What a beautiful weekend and a gorgeous green bow! Ok, what did you think about your Friday night movie choice? My hubs was less than thrilled but I thought it was kinda cute.